Mark Hervig, GATS Inc., Driggs, Idaho. The thermodynamic stability of nitric acid clouds near the tropical tropopause was proposed over a decade ago [Hamill and Fiocco , 1988]. However, these clouds have received little attention since that report and their properties and role in our atmosphere remain poorly understood. In fact, observational evidence for the presence of these clouds was only recently demonstrated using measurments from the Halogen Occultation Experiment (HALOE) [Hervig and McHugh, 2002]. Tropical nitric acid clouds (TNCs) were identified using HALOE multi-wavelength particle extinction measurements in conjunction with model predictions of spectral cloud signatures. The detection of TNCs and some properties of these clouds are described below. HALOE offers measurements of particulate extinction b(l) at 4 infrared wavelengths ( l = 2.45, 3.40, 3.46, and 5.26 mm). 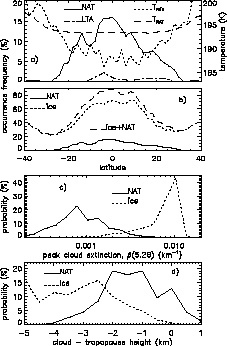 The HALOE response to clouds composed of ice, NAT, and LTA was modeled using appropriate particle size distributions and refractive indices. The model results are expressed in terms of the ratios of extinction at different wavelengths in Figure 1. Figure 1. 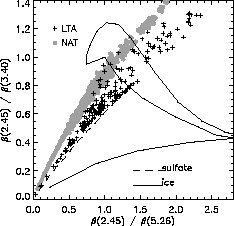 Extinction ratios calculated for sulfate aerosols and clouds composed of ice, NAT, and LTA. Ice results are bounded by the polygon for b(2.45)/ b(3.40) > 0.4, and compact enough to be represented by a single curve for b(2.45)/b (3.40) < 0.4. Model cloud signatures (Figure 1) were compared to HALOE cloud measurements to reveal the particle composition. The HALOE measurement in Figure 2 demonstrate cirrus and nitric acid clouds detected over the equator. Figure 2. Examples of HALOE cloud measurements near the equator that were consistent with ice (top, October 1, 1997 at 3°N, 290°E), NAT (middle, December 25, 1998 at 0°N, 259°E), and LTA (bottom, March 1, 1997 at 3°N, 48°E). Symbols indicate HALOE measurements below cloud top where 0.8 < b(3.46)/ b(3.40) < 1.2. a) Profiles of HALOE extinction and NCEP temperature. Cloud top height is indicated. b) HALOE extinction ratios compared to model values for ice, NAT, and LTA. Error bars are shown on every other HALOE measurement. 3. Properties of cirrus and TNCs determined from HALOE. HALOE measurements have revealed some properties of TNCs, including their distribution in latitude and altitude. The latitude distribution of HALOE NAT measurements shows that these clouds are restricted to tropical latitudes, with a peak in occurence frequency over the equator. This pattern is consistent with tropopause temperature patterns. Figure 3. Cloud properties derived from HALOE measurements during 1998 at latitudes from 40°S to 40°N. a) Zonal mean NAT and LTA occurrence frequency versus latitude. Also shown are zonal minimum tropopause temperatures (Tmin) from NCEP analysis during 1998, and TNAT calculated for 0.5 ppbv HNO3. Zonal mean NCEP tropopause temperatures are roughly 5 K higher than Tmin. T ice at the tropopause is about 4 K lower than TNAT . b) Zonal mean occurrence frequencies of ice, NAT, and the sum of ice and NAT. c) Probability distributions of peak cloud extinction. Peak extinctions were taken as the maximum extinction in each cloud identified. d) Probability distributions of the altitude where the peak extinction occurred relative to tropopause height. Hamill, P., and G. Fiocco, Nitric acid aerosols at the tropical tropopause, Geophys. Res. Lett., 15, 1189-1192, 1988. Hervig, M., and M. McHugh , Tropical nitric acid clouds, Geophys. Res. Lett., 29(7) , 10.1029/2001GL 014271 , 2002.